These are interesting times for the growth of mobile ad tech market in India. The market is at a cusp. With more innovation, collaboration and creativity, rising competition between players will lead to further improvement in the services, investments, and consolidation of services around ad tech. The trends that we have seen in previous few years is going to impact the events in 2018 too. While companies will continue to collaborate on data, analytics and other programmatic boosts, enhancing consumer experience will be the core of the success that companies now foresee. With consumers driving the momentum of the entire eco-system, mobile ad tech companies will focus more on newer offerings and enhanced product offerings. With e-commerce shopping gaining new levels of acceptance, concepts of artificial intelligence and machine learning will continue to be at the pivot of the overall consumer experience journey. On the other hand, smart consumers will continue to demand for enriched content. With video clearly dominating the space, different forms of content marketing will come into play and develop a sync with ad tech space. The focus will thus be on the collaboration between the marketers and brands targeting the consumers, and the players trying to bring a viable potent solution to these brands in the mobile ad tech space. Our survey and the subsequent report, ‘Scaling new heights – A case study on mobile ad tech market’ is an attempt to gauge the market and consumers’ preference. Tapping the trend across key cities, this is also the beginning of a series of information-rich content that we intend to bring every quarter for the audience. With insights into the consumer behaviour, it is our objective to present an overview of the market and also predict the changing preferences of the discerning consumers of today. I am sure that you will find the report useful and an interesting read. Arun Gupta– Founder & CEO, MoMagic Technologies Pvt Ltd Mobile ad spend is traversing an exponential growth trajectory in India, ticking over 80% in 2017. Mobile phones are high efficiency; high engagement and high reach devices, where humans tend to spend a significant time of their day – though a simple fact this has its own ramifications. 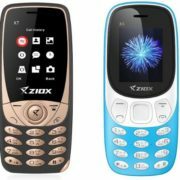 The easy availability of low-cost smartphones; decreasing cost of data plans; social trigger of possessing a smart phone; reducing the time for physical socializing and affinity towards purchasing things over the internet are some of the factors pushing the realms of mobile marketing in the country. A primary tool for this marketing are mobile ads. These are now acting as primary growth medium for digital advertising. Mobile ad technology is thus experiencing new highs with rising social interest, digitization of advertisement medium and culmination of data science with consumer behavior. The rapid increase in basic education levels, penetration of internet and social media, and general isolation of social relationships are factors pushing greater usage of mobiles and smartphones. 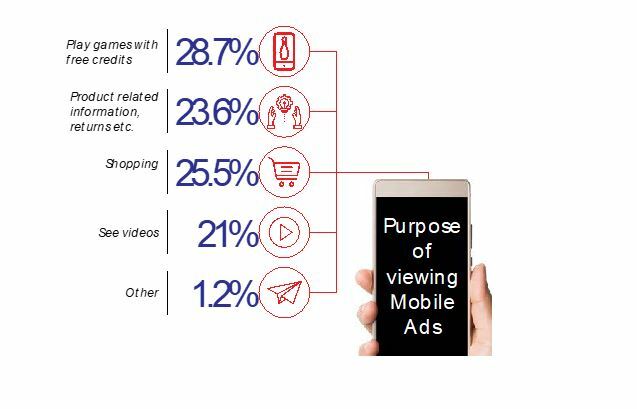 To understand better the pattern of mobile ad viewing, country’s leading mobile advertising player, MoMagic Technologies Private Limited conducted a large survey covering a population size estimate of 35,000 respondents. The survey was conducted over a period of three months October to December 2017, covering the festive seasons in India to capture maximum traffic using mobile phones and data connections. Intriguing it may sound, in a country that did not know what a smartphone is ten years before, currently ~83% respondents read advertisement messages on phones. This reflects the change our society has undergone in an era of digitisation. The impact or swiftness of conveying a message is actually becoming the key to success for companies looking to increase penetration across areas and regions. While talking about the swiftness of delivery, approximately 55% respondents quickly read the message in contrast to 24% respondents who read it later. 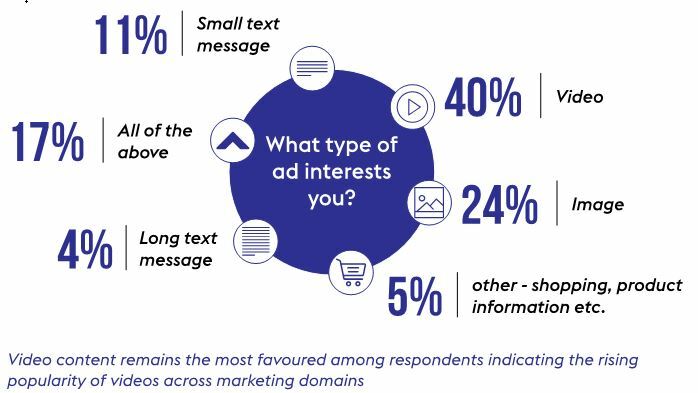 So, over three-fourth of the total respondents actually read the advertisement, which is bound to create deep impact on consumer behaviours and their purchasing psychology sometime later. With rising penetration of mobile services in the country, growing importance of mobile and handheld devices, marketers and companies are constantly focusing on mobile advertisements. However, our survey reveals that the sector has to evolve to really create an impact on consumers’ mind. There is a need to bring in varied content with the more focused approach. While artificial intelligence and machine learning are helping us to understand the consumers in a better manner, players in the space need to maximize the messaging within the limited time that consumers have. Thus, engaging content-rich videos and images work the best. 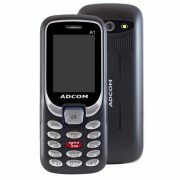 Mobile phones are used not just for calling and communications but is now used for news gathering, shopping, connecting to friends, measuring health, booking tickets in real time and a number of different ways. In this context, possession of phones itself is a key factor to look at. The growth of the mobile market in the country has been dynamic and so is the growth of the social media users. This segment, in particular, has added to the growth of mobile ad tech market. It is worth mentioning that social media is playing a key role in driving the global mobile ad-spend revenues. In the U.S., social media advertising revenues touched US$ 9.5 Bn in 1H 2017 reflecting CAGR of 51% over five years 2012-2017. Social media ad revenues increased by 37% in 1H 2017 over 1H 2016. For 1H 2017, digital video revenues from mobile touched US$ 2.6Bn as compared to US$ 1.6Bn in 1H 2016, reflecting a YoY growth of 62.5% in 1H 2017. As noted by industry experts, mobile growth is driving the mobile ad-spend revenues in India too1. To exemplify, industry findings reveal mobile internet advertising has seen steep CAGR of 76.8% over 20082017 as compared to a non-mobile CAGR of just 15.4% over 2008-2017. 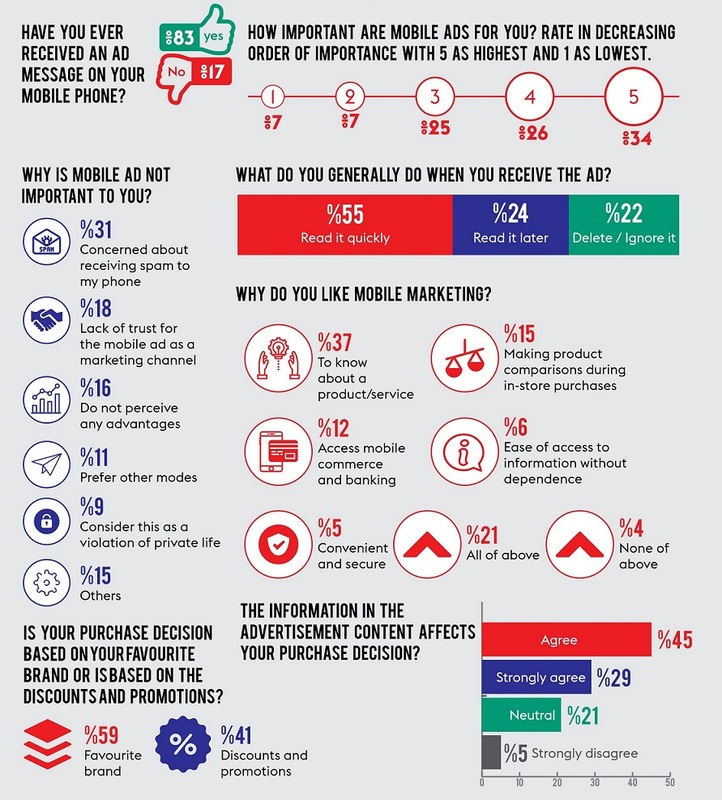 In the survey conducted in India, 34% of the respondents stated that advertisements in mobiles are very important. In this regard, globally mobile ad spending touched US$ 36.6Bn in 2016, accounting for 51% of the total overall digital advertising spending. While television continues to be most popular advertising medium, video ad spending grew 53% to US$ 9.1Bn, social media spending grew by more than 50% to touch US$16.3Bn and search engines by 19% to about US$35Bn in 2016. Mobile phones, especially, smartphones have proved to be a key enabler for masses in the country. Almost 40% of the respondents said that they possess at least one mobile phone, followed by 29% confirming to have two mobile phones. Significantly, a higher number of respondents have three or more than three mobile phones indicating the importance of a handheld device in day-to-day lives. The rising levels mobile phone use suggests that the future of mobile ad-tech space is bright. A gradual and steady shift in consumer behaviour along with knowledge and inclination to use smart phones is making way for mobiles with better functionalities, better display and faster processors. Information assimilation and making decisions based on that information is also becoming faster. The survey results indicate that over ~20% respondents see mobile ads for online shopping as well as gathering other product related information, returns, etc. 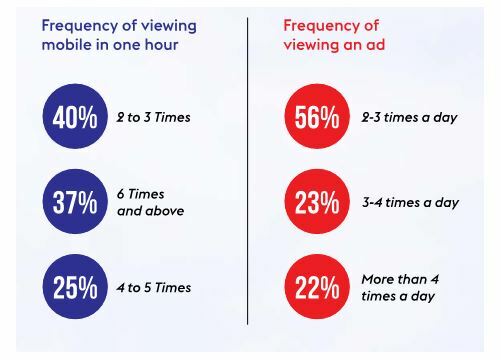 The ability to read information on products during free times, right on their palms and the ability to compare the same with other products on the same screen are few factors pushing mobile advertisements. To sustain the stiff competition, lower churn rate and expand customer base, telecom companies are lowering their data charges, introducing freebies, and bundling services. Experts have noted that India’s mobile ad spending is following an exponential growth trajectory, ticking over 80% in 2017 over 2016. Mobiles account for over 50% ad spending in the country. More than 20% of respondents view mobile ads for shopping-related information as well as product related information and returns. With e-commerce gaining popularity, mobile ads have become an effective medium to push sales. Industry trend analysis reveals that consumption of content via videos is going to increase year-on-year. Further, it is predicted that video format will drive 80% of all internet traffic by 2019. Experts have said that in 2018, the digital ad industry is expected to expand and innovate around different video outlets such as 2 vertical video, out-stream videos, 360 videos and interactive video ads. Video content remains the most favored among respondents indicating the rising popularity of videos across marketing domains. Furthermore, over the last year consumers have displayed an increased interest in content-rich storytelling rather than abrupt banner ads. This trend engaging customers better to create deep lasting impact (i.e. a purchase) is set to continue through 2018 and 2019. Native advertising is another trend set to rule 2018 as forecast by experts. The benefit of native advertising over traditional advertising is that it helps create better consumer trust, guides the consumer through the entire purchase process and ultimately leads to higher brand awareness and fewer recalls. And the video-rich content has an important role to play across these mediums. Another effective mode of establishing a prominent position in the market, influencer marketing, has proven to be one of the most effective forms of advertising in 2017. And the video has proved to be an effective mode of reaching out to a large set of target audience for most influencers. Influencers are digital personalities that create credibility in consumer’s mind. They generally have a massive follower/fan base but also a strong sense of credibility that viewers are more likely to trust. While companies have already started employing different advertising strategies, influencer strategy tends to create a long lasting relationship with the consumer or customer and also infuse a greater sense of credibility through building trust. Most companies have been predicted to deploy a larger repository of influencers in their ad and marketing strategy in 2018. 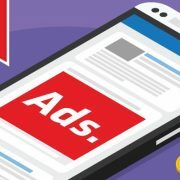 An analysis of the facts driving spending through mobile ads viewing reveal that India is one of the countries where people spend their highest time on mobiles. Advancement in technology has brought ease of shopping in fingertips. Apart from that rate of penetration of internet in India has been steadily increasing. Around 444 mn people in India use the internet, second-highest in the world after China. While 60% of the urban population in India has access to internet, only 17% rural population has access to the internet. The increasing rate of penetration of the internet at cheap rates has led to people viewing the mobiles for a longer time per day. Our survey reveals that close to 30% respondents engage in playing games in mobiles and view ads to earn free credits. Further, of all the respondents, 39% view their mobiles 2 or 3 times per hour followed by 37% who view phones six times or more per hour. 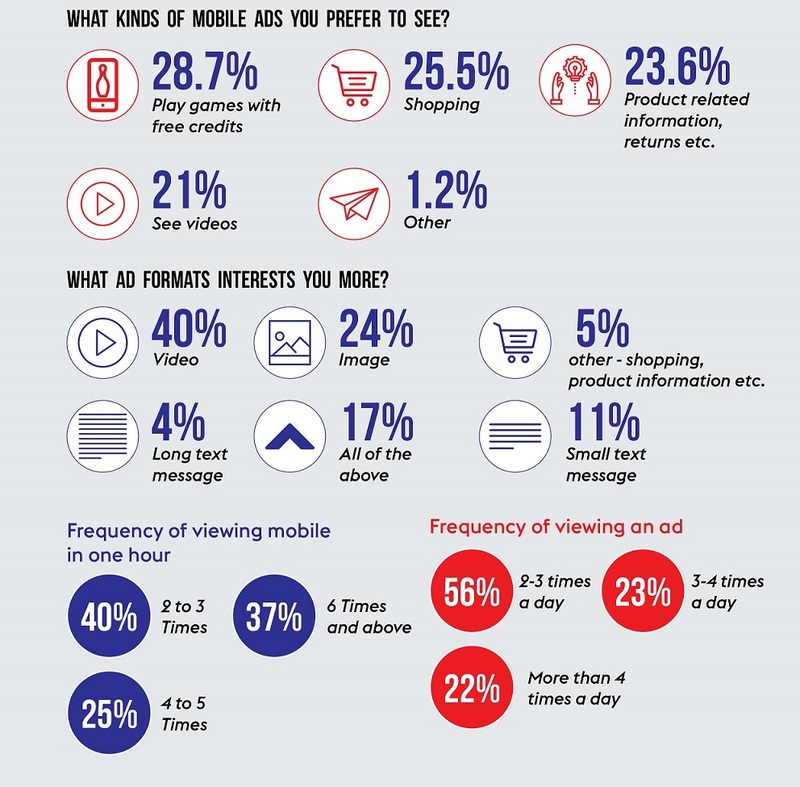 Also, 56% respondents reveal that they view mobile ads 2 to 3 times per day followed by 23% who view ads 3 to 4 times per day. This reveals that action time available to advertisers is really less to create a lasting impact on the customer mind. Other driving factors of mobile ads are easy availability of low-cost internet-enabled handsets and increased private discretionary spending on purchasing of smartphones. 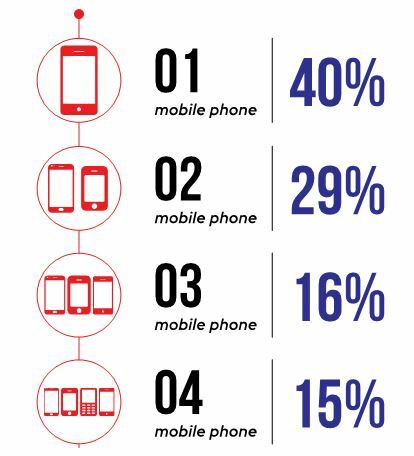 With 30% of our population having at least one mobile phone, the advertisement time is really less for marketers. Mobile marketing is gaining fast access in today’s Indian society primarily due to increased basic education levels among common public. 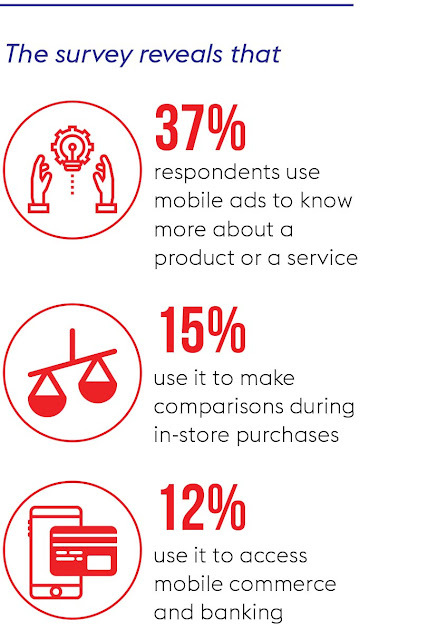 The survey reveals that 37% respondents use mobile ads to know more about a product or a service, 15% use it to make comparisons during in-store purchases, and 12% use it to access mobile commerce and banking. Research reveals that a large part of the mobile ad spend growth is led by small and medium enterprises, that cannot be tracked. The rapid decline in the price of high-speed data plans for example EDGE (GSM 2.5) followed by widening spectrum with 4G is fuelling the outreach of mobile advertisements among all sections of the society. What has considered impractical ten years ago is truth in current times. Experts have opined that innovation would be only sustaining mantra for mobile ad technology. Delivering sustainable personalized messages to the customer would be possible only through the brilliance of content, depth of the underlying message and provocation enough to convert into a purchase. Implementation of newer technologies like Artificial Intelligence (AI) and data sciences are also being rapidly assimilated into the mobile ecosystem to better understand and target consumer psyche and reach the client more innovatively. With all the good comes some bad too. There are several pitfalls of mobile advertising that deter a lot of customers from involving in monetary decisions. In our survey, among 6,603 respondents who answered the question, 31% are concerned about receiving spam to the phone while 18% lack trust for mobile as an advertising medium, 16% do not perceive any advantages over traditional medium, 11% prefer other modes and 9% consider this as a violation in their private life. Research experts add that the fear of mobile devices getting corrupt due to access of not trusted sources. A report from DataVisor, a big data fraud detection solutions-based company, has revealed that of every 100 installs, 15 are at least fraudulent. Loss due to fraudulent activities in mobile advertising is estimated to be US$300 mn every year. Fraud rates fluctuate in terms of installation volumes by countries. Saudi Arabia has the highest fraud rate of 15.8% followed by India 7.8%, the U.S. 6.5%, Russia 5.3%, and Germany at 5%. It has become very difficult to actually understand the reliability of an ad network. Under the circumstances, there are top three types of fraudulent activities in mobile advertising. Bots, Emulators & Clickfarm are the most common type of mobile app installation fraud, done through changing of Google IDs, increasing retention and post-installation. The second type of fraud is “click spam” or “organics poaching”. In this type of fraud a user lands in a webpage or app – a fraudster is operating. The third type of fraud is “click injection”. This type of fraud is very difficult to detect and often leads to loss of data and money of the mobile/app user. Other data science-related problem that is arising is monitoring the statistical viewing of ads. Last but not the least Indian consumers are very less receptive to online advertising as compared to other developed nations. Young Indian users have been noted to actively filter unwanted content through the installation of ad-blocking software, uploading mental firewalls, and banner blindness. This renders most online advertising ineffective as it reduces connection with the consumer through failed brand positioning. With smart technologies improving the mobile ad tech space and delivery of marketing solutions, we expect to see a transformation in business promotion. As a result, the Indian mobile ad tech market is all set to witness spectacular growth in recent times. Industry estimates suggest that digital advertising market in India to be valued at INR 9,700 Cr in 2017 with a 33% yearly growth rate. Industry stakeholders are optimistic regarding mobiles as a key access device that will continue to gain momentum both in rural and urban areas. Increased consumption of a second screen, widening mobile internet user base, rising penetration mobile commerce and technological advancement are prime factors that will aid the dynamic growth. While the focus will be on retaining customer’s interest through the creation of engaging content through video, visual tools, maximizing the output at tight budgets with real end-user applications will improve authenticity and reduce frauds. To support this, our survey indicates 33% of the respondents feel that the information of the advertisement affects their purchase decision. Additionally, our survey reveals that 43% respondents feel it important to be able to control what advertisement they actually receive. 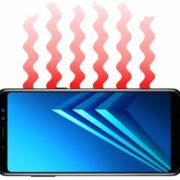 Significantly higher number feel that they should be able to control the viewing of the ad, when they will receive the advertisement in reality. However, brand loyalty stands above all push and promote a strategy of marketers. Despite all the controlling factors, the purchase decision of customers is guided by their favourite brands (59%) and discounts & promotions (41%). Thus, artificial intelligence and machine learning will be used for enhanced personalization and targeted promotion. Moreover, being quick and being accessible are the most sought-after attributes of a digitally incentivized market. There are plentiful customers ready with credit and debit cards to make the purchase, be it on impulse or planned. As such there lie enormous growth opportunities for marketers and advertisers to capture and embark on a dynamic-yet sustainable growth path in days to come. As many organizations are discovering new entrants in the mobile ad tech space, alliances of brands with new players will continue to drive growth, accelerate the transformation of the industry. However, the shrinking screen space on mobile phones, shorter attention span of mobile phone consumers, larger incumbents like Facebook and Google are to benefit. With this, there is a strong need for a new strategy that can help mobile ad tech firms. The recent change in algorithms by Facebook & Google (YouTube in particular) will capture a significant share of the market. While this will have a ripple effect on the market, players using mobile ad tech space will look at producing rich engaging content. This way companies will reach out to more and more consumers and will have more time with consumers. With news feed becoming the core of ad space, the lines will further get blurred between paid, sponsored content and real authentic content. Therefore, mobile ad tech space will continue to consolidate and become an important source of consumer information. As content quality will have certain benchmarks – authenticity will be the key.